Whelp. I just finished The Walking Dead. I… cried. Realized that this is the first game to make me do that, for real. Turns out that “fun” isn’t the only tool in the box that games can make good use of. I thought I knew that already, but I was never really sure until now. Wish more developers would take risks like this, and not just stick with the same old over and over. I highly recommended this game – it definitely gets my stamp of approval, for whatever that’s worth. If you want to play just one more game this year, do yourself a favor and play The Walking Dead. Jin and I just finished reading the Walking Dead comic books up to issue 96 (the first two compendiums); they’re amazing, too. I’m on a bit of a zombie kick since watching the second season of the show on Netflix. I got part-way through episode two of the game before losing interest. I’ll have to go back and give it another chance, I suppose. 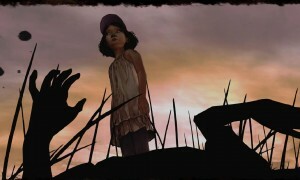 I realize that the game might not be up everyone’s alley, as it’s seems more like an interactive story/movie than a game, but for me it was the perfect format through which to experience the Walking Dead in game-form.